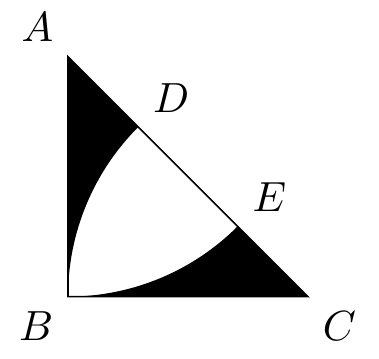 How to draw arc inside a triangle with tikz? I wonder how to draw something like this picture using tikz or tkz-euclide. I really don't have any clue what to do first. A solution without magic numbers (except for zero) and angle calculations. 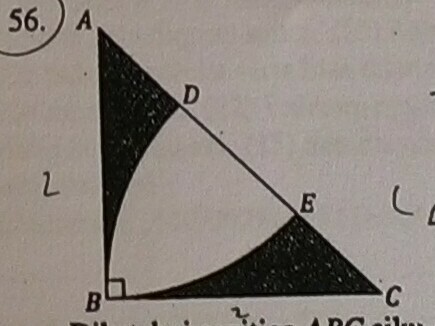 % and the radius for the circles in A and C.
% The areas are filled by filling the two circles in A and B. % Because of the "even odd rule", the intersection is not filled. 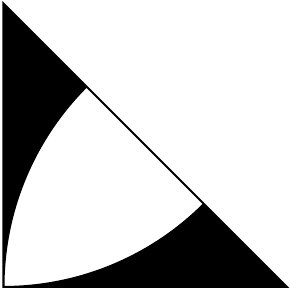 % The fill areas are limited to the triangle by clipping. % box calculations for the whole tikzpicture. 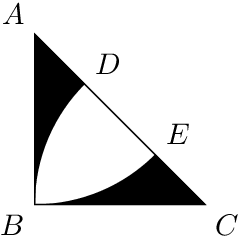 % The triangle is drawn. % The annotations with the point names. % via the syntax of distance modifiers. Too verbose compared with percusse's solution but, I hope, not so cryptic. What is the easiest way to recreate the picture using tikz or tkz-euclide? How can I shade part of a coordinate plane with tkz-euclide? How to draw border in TikZ?